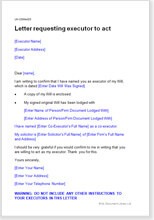 Letter requesting executor to act. Once you have drafted your will, you should write to the people you would like to nominate as executors of your estate to ask them whether they would be willing to take up the role. Alternatively, since their appointment only becomes official after your death and if they agree at that time, you may simply want to tell them that you have nominated them. This is a template letter that you can use as a basis for your own request or notice. We have articles about the choice of who should be an executor and their role in administering your estate on your death. The law on wills can seem complicated. We have prepared a number of short articles to explain the more difficult legal concepts. You may like to read some of our articles about preparing your own will.